An easy guide on how to clean your vehicle with a gobi rack or roof rack with step-by-step instructions and photos. Any vehicle owner with a full-length roof rack, like a Gobi Rack, for example, has most likely struggled with being able to clean and dry their roof and roof rack. Most full-length roof racks are designed to fit snug to the roof so that the aerodynamics of the vehicle is not completely thrown off. Having a full-length roof rack installed on your vehicle also means you aren’t able to go through any machine car wash systems. Doing so puts your vehicle at serious risk and can cause thousands of dollars of damage, not to mention the damage it does to your paint. 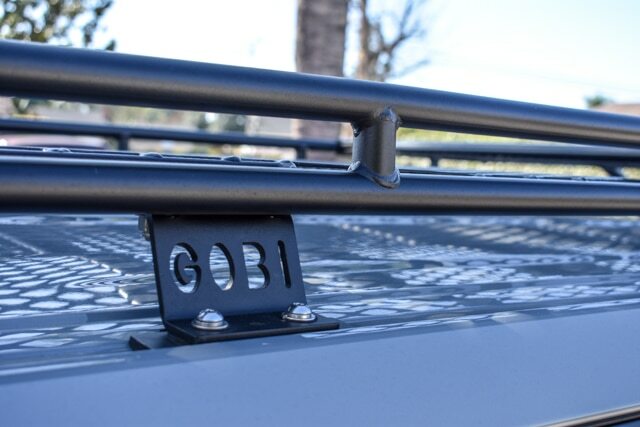 Gobi Racks are designed to fit closely to the roof, only leaving a couple of inches gap between the body and rack. This makes it difficult and frustrating to be able to reach in-between the roof and rack for proper cleaning and drying. Having a step stool will help you get those tough to reach areas of your room. A folding stool, like the Camco Folding Metal Step Stool, is a nice light-weight option that you can easily store when you’re not using it. The Swiffer Sweeper is the perfect tool for helping you reach the areas between the rack and the roof of your vehicle. The rotating flat sweeper head fits perfectly between the rack sections. You can easily attach a microfiber towel to the Sweeper’s head using the clips for both cleaning and drying. Microfiber Towels are the recommended towels to use when washing and drying your vehicle and roof rack. They are scratch-free, lint-free and swirl-free. You’ll want at least 2 wet towels and 2 dry towels for cleaning your vehicle. It’s nice to have a dedicated car wash bucket that you only use for washing your vehicle. You want to avoid cross-contaminating buckets since tiny rocks or small grains of dirt in your bucket can scratch your paint when washing your car. When looking for a car wash soap, use a non-detergent solution, like Meguiar’s Gold Class Car Wash, that cleans and conditions your paint at the same time. I tend to be a little O.C.D when it comes to keeping my vehicle clean. 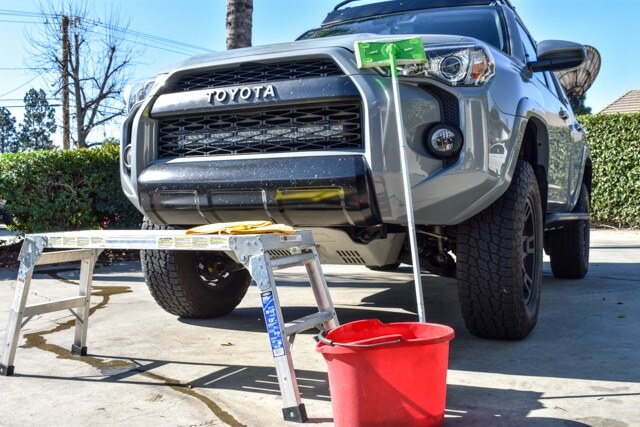 I was in for a rude awakening the first time I went to wash my Toyota 4Runner after installing my Gobi Rack. I realized I had no easy way of reaching the area between my roof and rack for cleaning and drying. I didn’t want to end up with water spots on my roof or have water running all over my vehicle once I started driving. The metal mesh of the Gobi was carryings lots of water and I was unable to dry the bottom half. I knew there had to be a better solution! 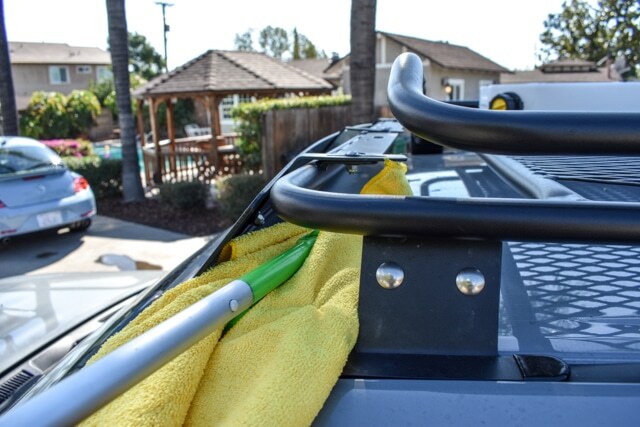 With just a few easy household items, you can wash and dry your Gobi Rack or full-length roof rack with ease! Just follow your normal car wash routine with your favorite car wash products. 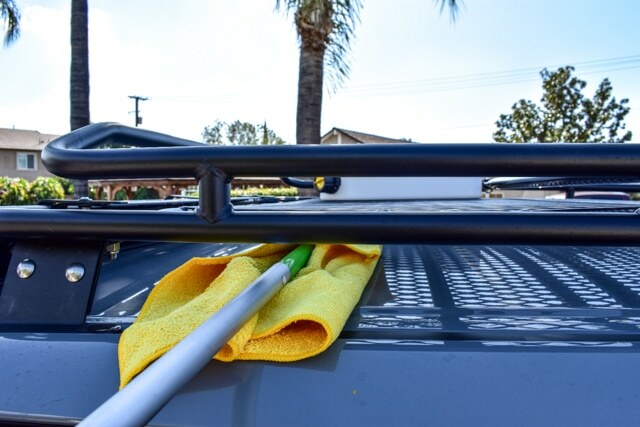 The steps below will help you finish the process, leaving you with a clean and dry roof rack! Wash your vehicle as you normally would. Use a Step Stool to stand up and use a hose to spray down the roof of your car. Use water pressure to remove any extra dirt or grime. Dry your vehicle as normal. We recommend using Micro Fiber towels for both washing and drying. Wrap a dry Microfiber Towel around the head of your Swiffer Duster. The towel should press into the clips on the top of the Swiffer to help the towel stay in place. Use your Step Stool to stand up next to your vehicle. Extend your Swiffer with the MicroFiber towel cover between the rack and the roof. I recommend starting with the top of the rack, then the bottom of the rack and finishing with the roof. The Swiffer fits perfectly between the segmented portions of the Gobi Rack. Your towel will soak up a good amount of water during this process. You can wring out the towel, or replace it with another dry towel, every couple of sections. If your roof is extra dirty, you can use this same method during your car wash process with a wet soapy towel. This will allow you to scrub some of those hard to reach areas.